NEW BRITAIN - Ryan McCarthy remembers feeling a mixed sense of excitement and anxiousness. Pete Rossomando, Central Connecticut State’s head football coach for the past five seasons, had just left to become the offensive line coach at Rutgers and National Signing Day was a little more than two weeks away. In need of a new coach and short on time to conduct a full search, the administration went with McCarthy, who had been on Rossomando’s staff the past four seasons as the offensive coordinator, and named him interim head coach. This is McCarthy’s first time being a head coach. Before arriving in New Britain in 2015, McCarthy spent 13 seasons at the University of Albany. He served as the Great Danes’ offensive coordinator from 2008 to 2013 and then their quarterbacks coach and passing game coordinator in 2014. 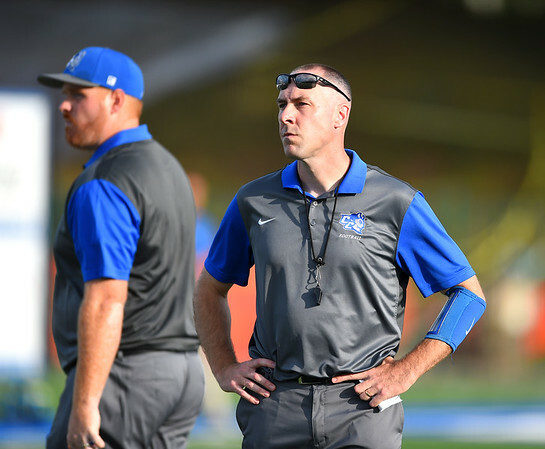 But the new head coach believes his previous stops have prepared him to continue a recent run of Blue Devils’ success that saw the program snap a streak of six consecutive losing seasons in 2017 and win its first Northeast Conference title since 2010. CCSU went 8-5 this past year, when it again was in contention for a conference crown. During that time under McCarthy’s direction, the Blue Devils ranked third in scoring offense (29.3 points per game), fourth in total offense (362.0 yards per game) and second in rushing offense (184.4 yards per game) in the Northeast Conference in 2017. In 2018, McCarthy’s unit ranked first is scoring offense (33.8 ppg), first in total offense (432.2 ypg) and second in rushing offense (223.6 ypg). McCarthy still plans on calling plays this season as he makes the transition from being up in the press box to down on the sidelines, though he still has to fill out a spot or two on his staff. The new head coach’s first meeting with the players to outline the direction of the program also went off without any kind of issues, McCarthy said. Both the staff and the players treated it like a typical day at the facility. Of course, wins are still important, and what McCarthy talks about needs to translate to the field. But just as the administration is confident in its new coach, so too is McCarthy that he’s up for the challenge. Posted in The Bristol Press, CCSU on Thursday, 7 February 2019 21:29. Updated: Thursday, 7 February 2019 21:32.